When it comes to weight loss, almond milk makes an amazing substitute for whole milk and skim milk, because it contains the same amount of essential vitamins and minerals but has fewer calories, which is essential for weight loss. A glass of almond milk contains merely 43 calories, which is half that of skimmed milk. It is low in carbohydrates which is also beneficial for weight loss. One cup of almond milk contains only 2 grams of carbs whereas a cup of skimmed milk contains 12 grams of carbs. So, whether you are a vegan, sensitive to milk, lactose intolerant or just don’t like the taste, almond milk works as an amazing alternative in smoothies and other recipes. You can choose between shop bought sweetened and unsweetened almond milk or use home-made almond milk for these almond milk smoothie recipes. This smoothie can be prepared in a jiffy and is ideal for busy mornings or a quick afternoon snack. This is a low-fat and low-carb smoothie that can be enjoyed even by weight watchers without any guilt. Weight Loss Benefits – Raspberry ketones are a natural substance that work as metabolism boosters and prevent an increase in overall body fat and the deep seated internal belly fat. The fibers also act as a key factor in weight control. Raspberries help in blood sugar regulation and controls insulin response. This also aids weight loss because excess insulin stores sugar in fat cells. Treat yourself to delicious desserts for breakfast with this rich and creamy banana almond flax smoothie. It supplies a considerable amount of proteins, vitamins, minerals and fibers to keep you energized throughout the day. Being packed with proteins, it works as an amazing post-workout smoothie. Weight Loss Benefits – The resistant starch found in bananas slow down digestion and take up space in the digestive system which in turn prevents over eating. It also boosts calorie burn when it ferments in the large intestine. The resistant starches also promote the body to increase the release of satiety-inducing hormones that shuts off hunger. Take a break from the same boring oatmeal every morning and enjoy a delicious and wholesome smoothie instead packed with the goodness of oats, almond milk, raw almonds, strawberries and Greek yogurt. No added sugar or sweetener makes this almond milk smoothie ideal for diabetics. Weight Loss Benefits – Strawberries increases the body’s production of hormones that stimulate metabolism and suppress hunger. It slows down the rate of digestion. It helps the weight-reducing hormones to work properly. Satiate your craving for sweet treats with this delicious and healthy blueberry smoothie that tastes as good as blueberry muffins, only much healthier. The super-thick and creamy smoothie keeps you fuller for longer too. Weight Loss Benefits – Blueberries are considered the healthiest of fruits and therefore, this almond milk smoothie can be easily included in the Paleo diet. The high level of phytochemicals found in blueberries affect the genes related to fat storage and fat burning and helps in trimming excess fat from our bodies. 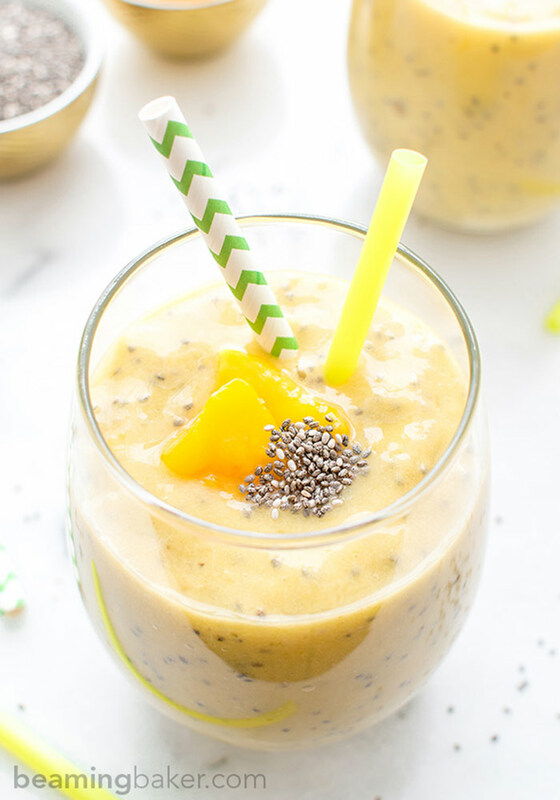 This wholesome and filling almond milk mango smoothie is a completely vegan and gluten-free take on the smoothie. The sweet and tangy mangoes add a tropical vibe while the chia adds some fiber, proteins and healthy fats to it. The bananas and almond milk add a nice creaminess to the smoothie. Weight Loss Benefits – The thermogenic properties of mango helps to burn calories at a faster rate by increasing the core temperature of the body. It also aids weight loss by working as an appetite suppressant. It increases the release of hormone leptin that regulates appetite. This vanilla-infused creamy and rich avocado and almond milk smoothie is the best way to begin your day on a super-healthy note. The banana renders a mellow sweet taste while the avocado and almond milk completely cover up the vegetal taste of the spinach. The best thing is that you can prepare this green smoothie way in advance and just give a little stir before drinking it. Weight Loss Benefits – Oleic acid found in avocados triggers the body to quit hunger. Monounsaturated and oleic fatty acids in avocado target stubborn abdominal fat and reduce the risk of metabolic syndrome. Antioxidants present in avocado fight the free radicals which otherwise affect your metabolism and slows down the calorie burning process. Here is a perfect green smoothie for complete detox using 4 basic ingredients. The sweet and tangy taste and fruity flavors of the strawberries beautifully balances the earthy flavors of the spinach. The bananas and almond milk adds a rich creaminess to the smoothie along with a touch of sweetness. Weight Loss Benefits – Leafy greens such as spinach and almond milk make a perfect combination for weight loss. The thylakoids present in the spinach leaves reduces cravings and helps to resist the temptation for unhealthy foods. In addition, spinach is low in calories and high in dietary fiber that boosts satiety without adding empty calories. Look fabulous and load up of and nutrients with the rich and creamy kale and almond milk smoothie. Packed with the goodness of leafy greens, pineapple, Greek yogurt, almond milk, honey and peanut butter, this smoothie is ideal for breakfast as well as snacks. Weight Loss Benefits – Kale is unusually high in fiber that helps to fill you up and keep you satiated for longer period of time. Calcium found in kale also plays an important role in weight loss. Calcium regulates the way in which fat is processed and stored in the body. Increased level of calcium in fat cells promotes fat burning and result in greater weight loss. Indulge in the stimulating and refreshing aromas of this tropical orange smoothie and bask in the goodness of oranges, banana, pineapple and almond milk. The citrus and fruity aromas of orange and pineapple perfectly complement the mellow sweet taste of the smoothie while the banana renders a nice creamy texture to it. Weight Loss Benefits – Oranges are high in fiber which helps to stabilize blood sugar so that you feel less hungry. The citrus juices also have alkalizing effect on the body that helps to reduce bloating and inflammation. Vitamin C found in oranges inhibits the production of cortisol, a hormone that promotes fat storage in the body. 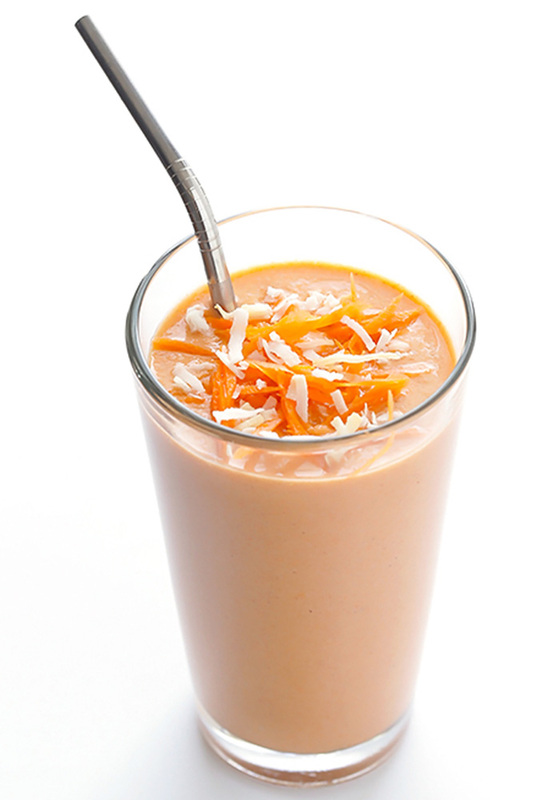 Enjoy the taste of traditional carrot cake in your breakfast smoothie with this delicious and healthy carrot cake smoothie recipe. The combination of spices such as cinnamon, nutmeg and ginger add some flavorful vibes while the banana, almond milk and Greek yogurt add a nice rich and creamy texture to it. Weight Loss Benefits – Vegetables such as carrots are low in energy density because of their high water and fiber content and low fat content. So, carrots help to fill you up while consuming fewer calories. The fibers found in carrots are slow-digesting, which means it takes longer time to move through the intestine and therefore, helps to keep you satiated. Vitamin A found in carrots communicates with your fat cells and influence fat storage and reduces abdominal obesity. Being rich in fiber and low in saturated fat, almond milk makes a beneficial addition to your weight loss smoothies that help in weight loss, weight management and healthy digestion.